'Tis the season when style and good taste usually surrender to tackiness and blind devotion to kitschy tradition. But as holiday entertaining begins in earnest this weekend, reconsider. You can have it both ways. Take a cue from Harrison & Shriftman, a premier marketing, public relations and event planning firm behind countless star-studded parties for the fashion industry. A signature of its events is the irreverent blending of high and low. Its glamorous parties have been known to feature junk food, toys, games, trashy novels and cartoon characters. A party for author (and master event planner) Lara Shriftman took her advice to heart. 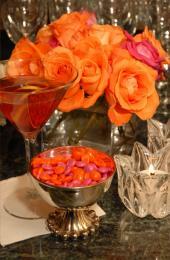 The hosts offered a signature drink (the 'Lara-tini') and M&Ms embossed with 'TX loves Lara. So yes, Virginia, there is a place in the stylish world for dancing Santas, aluminum trees, tooth-rotting nogs and deep-fried gut bombs, if they are used to add levity and humor to general elegance, and if the party is planned well enough to allow the hosts' thoughtfulness and generosity to shine brightest. The co-presidents of Harrison & Shriftman wrote "Party Confidential," which launched this month (Bulfinch, $29.99). Lara Shriftman and Elizabeth Harrison spotlight some of their firm's most creative shindigs, and they pack the book with tips. Last weekend Shriftman was the guest of honor at a book party at the home of Frank and Margaret Krasovec, which has one of the loveliest façades in Austin. I've always admired the colonnaded brick structure and the diagonal setting on the tree-shaded corner of the street, and was excited to peek inside. Carla McDonald and Lance Morgan, who are both publicists and go way back with Shriftman, also co-hosted with Margaret Krasovec. The party would have fit seamlessly with the 10 celebrations that are showcased in the book: an organic dinner party in the Hollywood Hills, a sugar-fueled surprise birthday party for Serena Williams, two bashes for novels by Hollywood wives, a pool party for the launch of Juicy Couture swimwear, a yellow-themed boutique party to push Tweety Bird apparel, a disco party for an 11-year-old's birthday, an over-the-top playdate for 24 dogs and their people, a poker tournament and a launch party for Paris Hilton's perfume. Lighting, table settings, music, invitations, gift bags, food, decor and flowers are outlined for each. The book also features advice for a successful fundraiser, party tips from celebrity friends and the best recipes from elite restaurants, including Nobu and Mr. Chow. •1. Overinvite. Invite five extra people for every 20 expected guests. •2. Invite an interesting mix of people. Everyone wants to see old friends as well as meet new people. •3. When setting a budget, decide what is most important to splurge on. Reserve 15 percent to 20 percent of your budget for overages and last-minute ideas. •4. An intriguing location, such as a hot new bar or an amazing home, guarantees RSVPs. •5. Give a start and end time, and avoid having a long time frame. This ensures a good crowd at the desired time, instead of guests trickling in and out and missing each other. •6. Greet guests with a cocktail. Consider serving a signature cocktail. But also . . .
•7. Have plenty of non-alcoholic beverages. •8. No buffets. Passing bite-size hors d'oeuvres keeps guests from being encumbered with plates and utensils. •9. A party is no place for diet food. Offer a decadent balance of sweets and salty/savory treats. •10. Practice makes perfect. Do a run-through a week before, a day before, and the day of. These tips were put into fabulous motion at the book party. Guests sipped "Lara-tinis" and nibbled hors d'oeuvres ranging from fancy-fance to macaroni and cheese. At the bar was a bowl of M&Ms printed with "TX loves Lara" on the backs. And because you know some of the guests would have been miserable if they couldn't see the Michigan-Ohio State football game, they were discreetly accommodated with a small TV. The guest list was only 75, but the perfect 75. "It was my favorite book party that I've had," Shriftman said. "Everyone I met was so sweet and kind. And it's a big deal to let someone else do a party for me, but I loved the way they interpreted the information in my book."